Rohayl Varind, the title ‘Superhero of Pakistan’ has been doled justly. The young social activist and educationalist is hell-bent on educating the nearly 23 million out of school children in Pakistan. In a country that suffers socio-economic problems all around, Rohayl has his work cut out for him. A noted trend seen in the average 7 to 9-year-old of Pakistan is child labour. Given the fact that the poverty rates are ridiculously high, these children have no other choice for survival. Having experienced the freedom that comes with education- Rohayl decided to do better for these children. 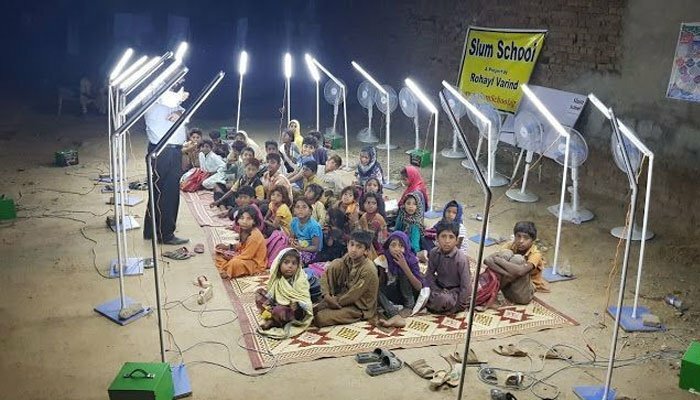 Besides the other welfare projects that he heads, Rohayl has taken it upon himself to set up and run Pakistan’s first slum solar school for children in Faisalabad, 320 kilometers from the capital- Islamabad. 60% of Pakistan was illiterate in 2016. The illiteracy rate dropped to 58% in 2017, and is expected to drop by another 2% in 2018. An ingenious idea that feeds directly into the growth of all those that attend. He’s also been mindful of the fact that these children are doing all they can to get through the day, so these classes are held in the night- 7pm to 9pm. While the fact that child labour isn’t legal, Rohayl is equipping these children with the knowledge and skills that will carry them through their teenage years and help them forge a future free of dependence. Rohayl currently educates over 100 children split between two schools. His classes vary from popular languages such as English and Urdu and subjects that have academic relevance such as science and math. These limited subjects are part of an effective education model that seems to work. Rohayl understands the limitations his students face and his experience has taught him exactly the value of this model. Although the students are also exposed to other development skills through the volunteering program that Rohayl has in place. Activists and friends of Rohayl also contribute to this cause with training in arts such as Taekwondo, crafts and theatre. Moving over to the industrial training, the students are also exposed to training in proficient use in technology which further translates over to graphic designing. It is evident from this statement that Rohayl will not let circumstance be the decider for his goals. In a world run by technology, the lack of electricity is equivalent to a human being placed in a vacuum. Going one step further has always been the way of the 23-year-old Rohayl. Winning the World Summit Youth Award back in 2014, he is an innovator and an entrepreneur. The first Pakistani to receive the global award is a feat in itself. His innovations also include the ‘Solar School Bag’ which will be revolutionary in a country which experiences as much sun time as it does. Rohayl Varind has pushed the limits of social reform and changed the fabric of educational technology. The world demands more from its innovators, and it is people like Rohayl that are setting the standard for the others out there like himself. We hope to set out a ripple of change towards the common goal- Education for all.